Southern Rockies Nature Blog: "Where Were You When the Dam Broke?" Click over to Coyote Gulch, the water blog, for a short video and story about the failure of the Castlewood Canyon Dam and the subsequent flood in Denver, eighty years ago yesterday. 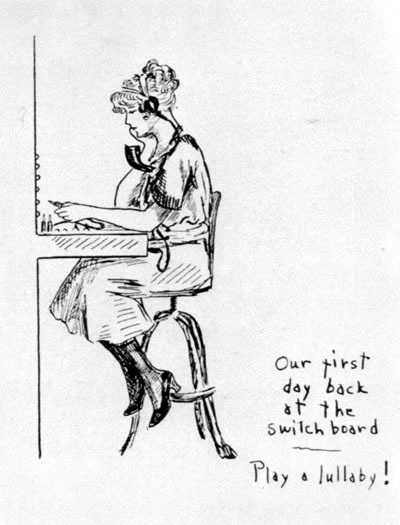 As so often happened in such disasters, it was the telephone operators who authorized themselves to make "reverse 911" calls, decades before such systems were invented. That was back when you rang for the operator and got someone relatively local who could, at times, make decisions and show initiative. Now we have 911 call centers — although your mobile telephone call does not necessarily go to the right one. For other telephone needs, you get somebody in India who is reading from a script. 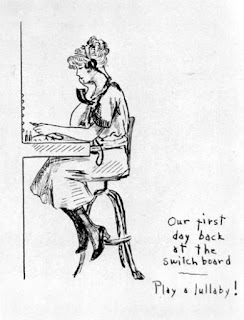 The sketch was drawn by Wilma Cary, one of the Pueblo telephone operators who stayed on the job during the big flood of 1921. The Pueblo, Colo., flood was in 1921, and I borrowed the sketch to tie it to the link about the 1933 flood in Douglas County, Colo. If you read "1912" somewhere, maybe that was a typo?